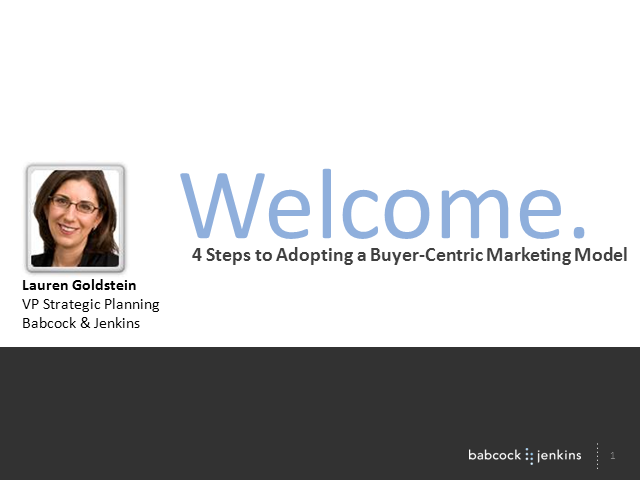 Moving toward a buyer-centric marketing model is an essential strategic requirement in B2B marketing today. As marketers, we have a tendency to indulge in marketing strategies that focus on *our* priorities, *our* key messages and *our* current content assets first. A buyer-centric model naturally prioritizes the buyer’s business challenges and the questions they need answered to make a purchase. Lauren brings more than 15 years experience in demand-centric marketing to her role. Her number one responsibility is to collaborate with clients and prospects - and the agency - to align business objectives and campaign goals. With experience on both the client and agency sides of the business, Lauren has worked with some of the world’s most respected companies, including Adobe, Microsoft, Intel, HP, Ciena, Symantec, Getty Images, NetApp, Sterling Commerce, Cruise West, Starbucks, Sun Microsystems and Starwood Resorts.